It’s that short wilderness camping season here in the Rockies–I’ll post as I can, but this afternoon we’re loading up the wagon and heading on down to Durango for a little ride on the Durango to Silverton narrow-gauge railway and a little hike up to Chicago Basin. Maybe I’ll finally get to Mesa Verde, which apparently was the inspiration for “Blue Mesa” described in Willa Cather’s The Professor’s House, which I finished reading just last night upon the recommendation of our old pal Roxie of Roxie’s World. Dead dogs have suprisingly good book recommendations, friends! Looks like creepy doll is exploding out of kitty’s head. Creepy doll on poll = Lady of the Flies? Have a grand high wilderness adventure, Historiann, and by all means do swing by Mesa Verde, which is glorious! Treat yourself to a meal at the lovely Far View Lodge — Moose recommends the Rocky Mountain trout, or something like that. It’s been a few years. Glad you like The Professor’s House. It’s one of Cather’s very best, even if Godfrey St. Peter is pretty clueless when it comes to teh wimmins. Hey, his sewing forms were kinda creepy dolls, don’t you think? Er, that should be pole, of course. D’oh. If you’re near Mesa Verde, get to the Anasazi Cultural Heritage Center in Dolores. A great museum on BLM land with a focus on Basketmaker culture. Reading list: Richard Wetherhill: Anasazi (nice biography of Wetherhill). David Lavender One Man’s West (I think that’s the one about Telluride). If you can swing over to Ophir and see the famous Ophir loop. Or hike over the pass. Bridal Veil falls is a nice hike in Telluride that will get you back to the train in time to go home. I adore your creepy dolls. You sure you’re not a closet archaeologist??? Willa Cather’s now on my reading list, thanks to recommendations from That Dead Dog and now yourself. Have safe travels and fabulous adventures! Doing some archaeology of these linked posts and their embedded pictures, that appears to be a black-haired newcomer in blue in the back corner of the front box. Did she replace the tiny blond doll sitting there a year ago that I think you described as having been found on the beach in Maine? (I’d recognize that cat anywhere!) The “New Social History” (r) was once critically described as a form of serial statics–one flat snapshot after another insufficiently linked by stories about change–until the “New Narrative History” ™ muscled its way back into the journals, or tried to. These occasional updates with their links within links sort of gives the blog a feeling of cosmology. Maybe the cat can take care of the creepy dolls! Have fun! 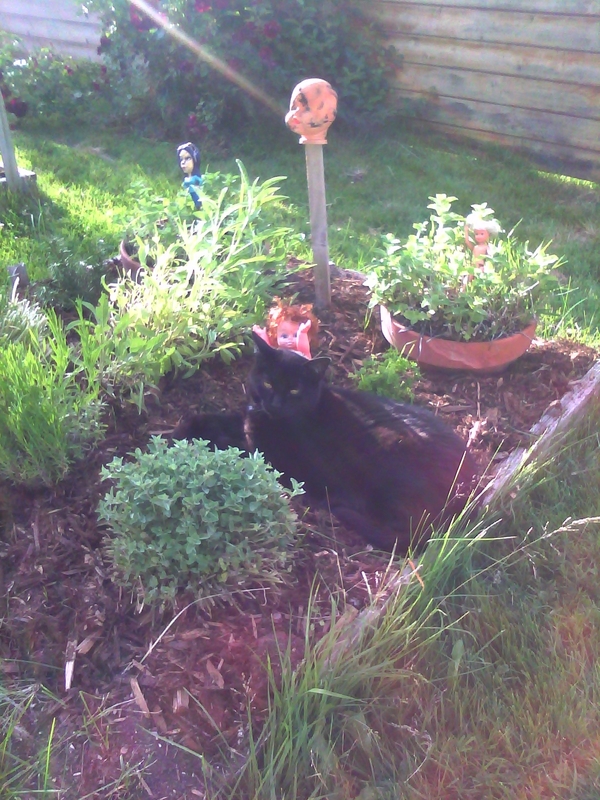 Indyanna–the tiny blond doll is in the mint behind the cat. No cats were harmed in the taking of this photo! I love this state. There are so many awesome places we can go to to get away from all the other a-holes here. Any thoughts on Chris Wallace’s recent question to Congresswoman Michelle Bachmann: “Are you a flake?” on Fox News? The cat scoffs at the creepy dolls. I think I wish I had read Cather’s novels in the order they were written. Darker, and darker, they go. My Mortal Enemy fit my mood at the time I read it but Song of the Lark, is my favorite. I read Song of the Lark so long ago that the details have gone missing but twenty+ years later, I can still remember how I felt about the book when reading it.